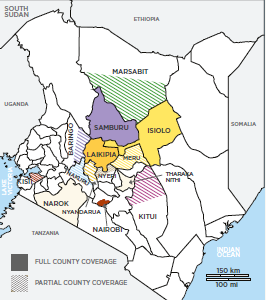 CHAT's area coverage extends to otherwise underserved and often remote communities throughout Laikipia, Samburu and Isiolo. CHAT also provides services in parts of Baringo, Marsabit, Nyeri, Meru, Tharaka, Kitui (Mwingi North), Kisii, Narok, Nairobi & Nakuru counties. Approximately 80% of the inhabitants receiving CHAT's services live in under-served rural areas. In Samburu, Laikipia, Isiolo, Marsabit & Baringo the people are largely transient, semi-nomadic pastoralists from a number of ethnic groups, including Samburu, Turkana, Pokot, Boran, Somali, Mukogodo. ​The majority of inhabitants CHAT reaches live in extreme poverty, subsisting on less than US $2 a day.